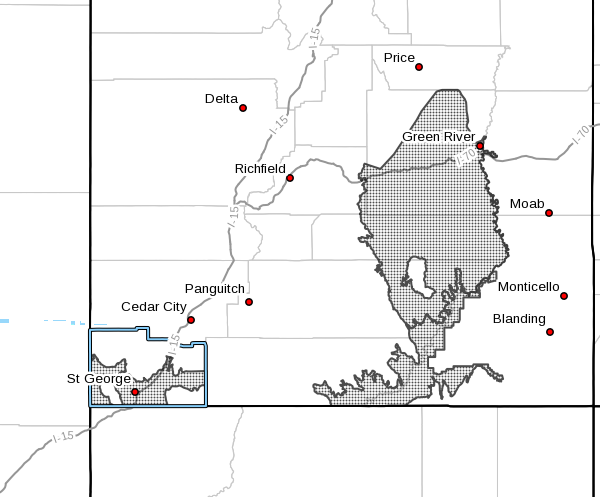 ST. GEORGE — The National Weather Service has issued an excessive heat watch for Southern Utah. The watch will be in effect from Sunday afternoon to Wednesday evening. An excessive heat watch means that a prolonged period of hot temperatures is expected. Hot temperatures will create a dangerous situation in which heat illnesses are possible. Drink plenty of fluids, stay in an air-conditioned room, stay out of the sun and check up on relatives and neighbors. Utah’s Dixie including Zion National Park, the San Rafael swell including Capitol Reef National Park, and the Glen Canyon recreation area including Lake Powell. A heat wave is forecast this week. Heat can be quite dangerous, especially for outdoor recreation. Those not acclimated to this level of heat, those working outside and those without air conditioning will be greatly impacted as well as young children, the elderly and those with preexisting medical conditions. The heat index will be near 105 degrees.